No matter whom you are, Sydney in Australia has much to offer for you. And though the city is popular for its magnificent harbour bridge and the Opera House, there is much more to see and do here. With cobbled streets and numerous colonial buildings, The Rocks is likely to be the oldest portion of Sydney city and any visitor should visit. Be sure to also tour the weekend market, the Earth Exchange geological and mining museum and not forgetting, the many gift shops. With its awesome display of pyramid glass houses, rose gardens and rich plant life, the Royal Botanical Gardens is a must-visit place while touring Sydney. The Royal Botanical Gardens is a place of natural beauty than any person visiting Sydney should tour. People come here for a variety of reasons; for education, relaxation, peace, to learn about different plants and horticulture, you name it. Set in 30 hectares of land, the Royal Botanic Gardens display thousands of exotic and local plants that are unknown to the rest of the world. 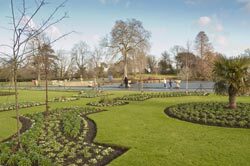 Best of all, the parkland is a place for entertainment, recreation and sport. In these gardens, you will discover different outdoor features such as sculptures, a restaurant set deep in the woods and a gift shop that sells different plants. For those who prefer picnicking, there are a number of free gas barbecues for utilization. A visit to this place will totally astonish you and make you get rid of day to day living worries, if at least, for a couple of hours. 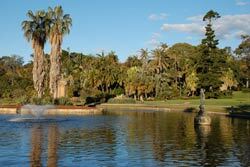 The Royal Botanic Gardens are open every day of the year and access is free of charge. There are however a number of ways to reach here, with the most popular and probably the cheapest being by a hired bus. For around $8 per person, you can board a hired bus for the trip there. The firms that offer these bus services can arrange for personalized guided tours for your group, and all this for free! The gardens are located on the shores of Sydney Harbour, with the Circular Quay and the opera house being on the western boundary. For a more adventurous tour around the Royal Botanical Gardens, you might want to take your family members with you, in addition to your camera. Join the plethora of guided tours that are organized by a number of reputable professional tour companies. For instance, for a more personalized touring experience, take advantage of a private tour by a hired coach or minibus. These tours are customized to suit your personal preferences and touring needs. We can arrange transport for groups of any size to Sydney Royal Botanical Gardens, please call or send us an email for more information.